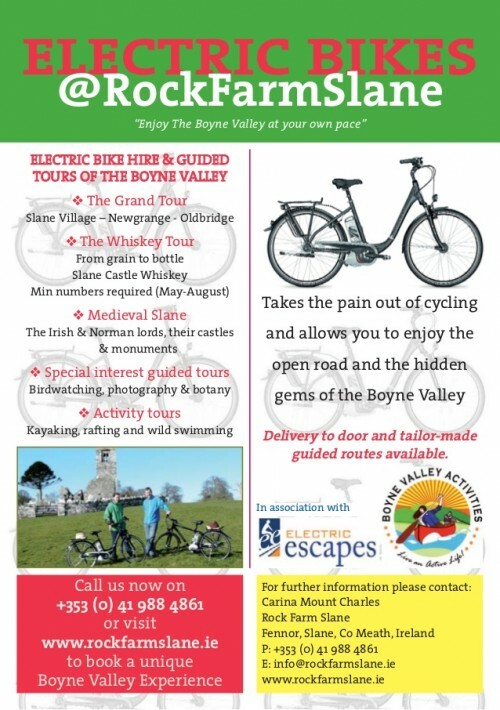 Rock Farm Slane has 8 electric bikes available for hire all year round for guided tours, self-guided routes or general hire in the Boyne Valley. These tours are certified as Gold rated activities by Ecotourism Ireland. Discover Ireland has selected the Boyne Valley as one of the Top Ten Destinations for 2014 and provides a useful destinations map above. Rock Farm Slane is a founder member of the Electric Escapes Ireland network and uses the same high standard Kalkhoff electric bicycles to provide the longest range and safest travel throughout the Boyne Valley. We provide everything you need including a high-vis jacket and a helmet. Rock Farm Slane offers secure bike parking to our Glamping guests and special discounted offers on electric bikes and normal bikes to guests. We have access to normal bikes, but will require more than 24 hours’ notice for these kind of requests. We are also happy to offer electric bikes to other visitors to the area, please contact us below or call 041 988 4861 for more information. This is truly a grand tour taking in the 3 main destinations in the Boyne Valley: Bru Na Boinne (Newgrange) complex, The Battle of the Boyne site at Oldbridge and the infamous Slane Castle rock venue and soon to be whiskey distillery. We can provide discounted tickets to the above-mentioned attractions. Please add as an option on the form below. Guided tour – bicycle hire and dedicated guide, includes refreshments, picnic lunch and opportunity to visit a local artisan destination. Local starting point in Navan, Drogheda or Trim areas – more than 24 hours’ notice required for delivery to local starting points. Rock Farm Slane or other starting point >> ROUTE A: Newgrange or ROUTE B: Oldbridge >> ROUTE A: Oldbridge or ROUTE B: Newgrange >> Slane Castle (May to August) >> return to starting point or Rock Farm Slane or Drogheda Station. 3 ½ hours travel time. 1 full day including visits to each tourist attraction. Easy route, includes some stretches on main roads from November to April or during wet weather. Self-guided – bicycle hire and tailor-made guide, stops will depend on the farmer’s availability. Notice of 1 week required. Group or Guided tour – (minimum of 4 people required) bicycle hire and dedicated guide, includes refreshments, picnic lunch and opportunity to collect your lunch as you go. Rock Farm Slane (organic farm tour) >> Shalvanstown (organic farm tour) >> Mullagha Farm (Boyne Valley Blue Cheese) >> Cider Mill (Cockagee). Please contact us using the below form for reservations and more information on our tailor-made tours. Once you have contacted us regarding availability of Electric Bikes we will direct you to our Paypal or other payment facilities for paying deposits and final balances.